The Imperial Palace (in the West): here is where the Imperial family resides, entrance only with a free tour or at 2 specific days a year. The East Gardens: this is the site of the former Edo Castle. Free entry during the whole year. Upon entry you receive a token that you need to return when you leave. Connected to these 2 main areas are 2 smaller gardens: Kitanomaru in the north and Kokyogaien in the south. 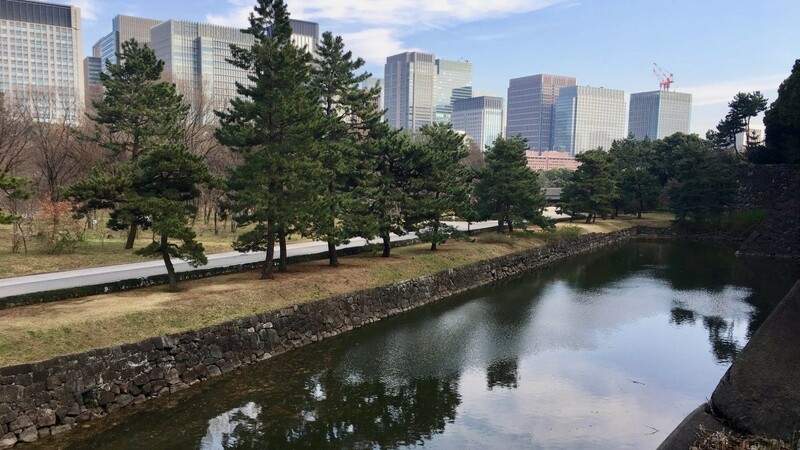 The inner grounds of the Imperial Palace are not open to the public to freely roam around. 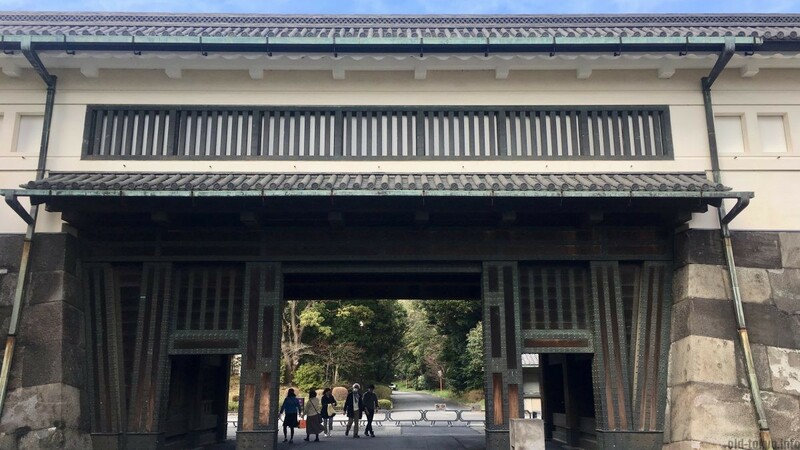 In order to enter you need to book a free guided tour organised by the Imperial Household Agency at least one week before your visit. The other option is to visit on the birthday of the emperor (next 23 December 2018, then from 2020 on 23 February as Naruhito becomes emperor in 2019) or 2 January, but I would advise against that as way too many people will visit on those days, starting with very long queues to just get in. 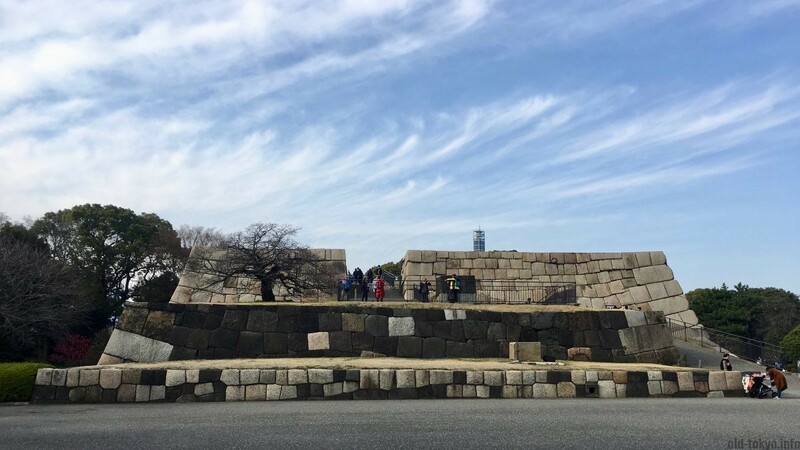 Keep in mind that the tour takes you to the inner grounds, but it does not give you a comprehensive tour on everything noteworthy there is to see at this location such as the old buildings in the East Gardens (the former site of Edo Castle). Nevertheless, I do recommend to take the tour, otherwise there is a big chance that you may find your visit to the palace quite boring as without the tour you cannot get close to some of the highlights that are on offer. 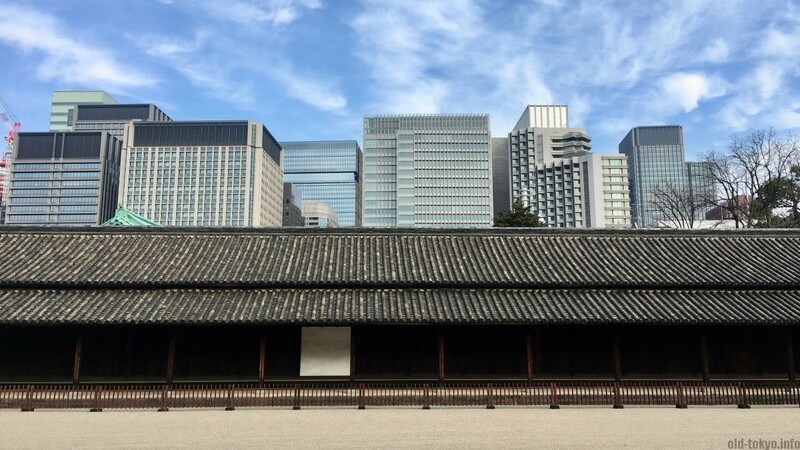 I have made a selection of places at the Imperial Palace to help you organise your visit. Please note these are not all places of interest as there are too many too mention. My selection is based on the whether the location is interesting and/or historically significant. To make it even easier, you can even follow my suggested itinerary at the bottom of this page. The official free tour takes 75 minutes. A visit to the East Gardens takes easily 2 hours. 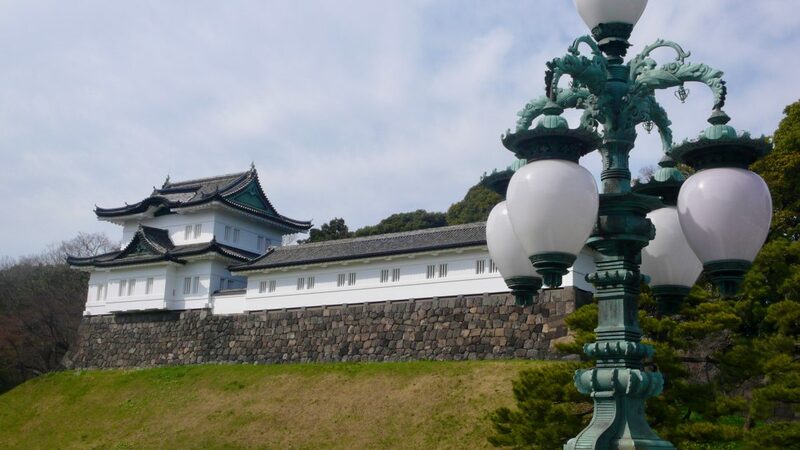 The Imperial Palace is located on the site of the former Edo Castle, the centre of power of the Tokugawa Shoguns during the Edo period (1603-1868). It was very symbolic that the emperor would be located right here after the Meiji Restoration (1868), to emphasize his role as leader of the country. The seat of the emperor had been traditionally in Kyoto, but as the centre of power was shifted to Edo for a couple hundred years, it was deemed that the new leader (the emperor) should also be here. The first Edo Castle was built in the mid 15th century, but is no longer there. Even the original palace of the Emperor that was built in 1888 is no more. The oldest building that remains of which we know the exact date when it was built is the Fujimi-Yagura Watchtower (1659). 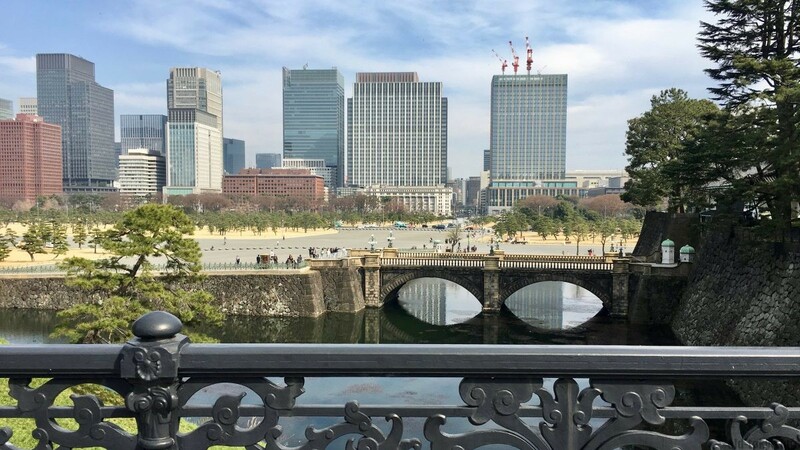 The most iconic view of the Imperial Palace is the bridges that make up the official entrance to the Palace with the Fushimi-Yagura Watchtower in the background. I was astounded to see that many visitors I know managed to go to the Imperial Palace without getting a glimpse of the most iconic place. You cannot get close, so you have to take your picture from a distance (bring a zoom lens for best result, see my photo below without a zoom). Meganebashi (means Eyeglass Bridge, official name seimon-ishibashi) is the stone bridge, it was built in 1889. As it is on the foreground when looking to the palace, it is often mistaken for being the Nijubashi. You can find its location on the map at the bottom of this article with orange number 1. 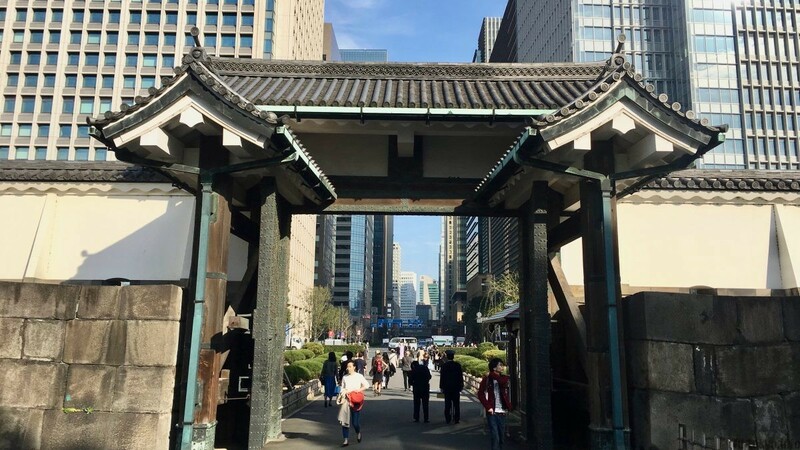 Nijubashi (literally double bridge, official name seimon-tetsubashi) is the main entrance to the palace and is just behind the Meganebashi. The name originates from the old bridge that was made of wood. In order for the bridge to support itself, it was made of 2 layers, hence double bridge. It was replaced by an iron bridge in 1888. You can find its location on the map at the bottom of this article with orange number 2. The Imperial Palace is surround by a moat. Several bridges and a gate (mon in Japanese) give you access to the grounds. The massive wooden doors with copper bracing are nothing short of impressive. There used to be a whopping 92 gates at Edo Castle, including 6 large gates such as Ote-mon. When you enter the premises you will likely enter through one of these gates. Now, only 8 gates are left in total according to the Japan National Tourism Organisation. Ote-mon used to be the main gate of the Castle. This gate is special as it is made up of 2 gates placed perpendicularly of each other creating a square space in between. This is thought to make it more difficult for intruders to get to the castle grounds. You can find its location on the map at the bottom of this article with orange number 3. There area number of interesting buildings at the site, but contrary to what you might expect, the palace building is not one of them (I didn’t even include a photo of the palace in this article). 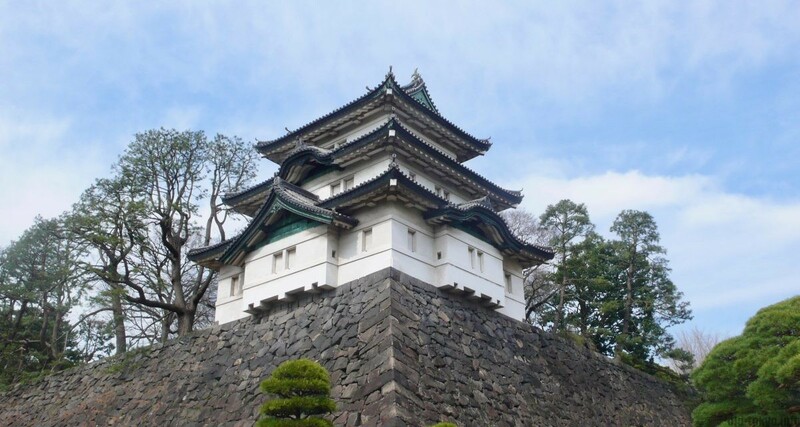 However, 3 watchtowers, 3 guardhouses and 1 defense house remain from the days of Edo Castle. 1. Fujimi-Yagura Watchtower (1659): This three-storey square-shaped watchtower thanks its name from the fact that Mt. Fuji used to be visible from the tower. Edo Castle used to have many of these watchtowers, but this one is special as it became the symbol of Edo Castle after the castle’s main tower was not rebuilt after the great fire in 1657. The curved walls are built according to the uchikomihagi construction technique in which stones are stacked to create a wall and then hit with hammers to create a flat surface. The white building perched on the 15 meter high wall makes it a truly beautiful sight. You can find its location on the map at the bottom of this article with blue number 1. 2. Fushimi-Yagura Watchtower (mid-17th century): This one is being touted as the most beautiful watchtower. It was originally built in Kyoto at Fushimi Castle, but Shogun Tokugawa Iemitsu (reign 1623-1651) asked for it to be dismantled and brought to Edo, and here it still is. This watchtower has a rectangular shape, with at one side the two-storey tower. This watchtower is the one that is featured in most the photos about the Imperial Palace with the Meganebashi (stone bridge) in front and the Fushimi-Yagura in the background. You can find its location on the map at the bottom of this article with blue number 2. 3. Sakurada-Niju-Yagura Watchtower (also called the Tatsumi-Niju-Yagura): The last remaining corner watchtower. It is the least impressive of the 3 watchtowers, but very visible as you can look at it from right across the moat. It was destroyed during the Great Kanto earthquake of 1923, but soon rebuilt in its original form. You can find its location on the map at the bottom of this article with blue number 3. 4. 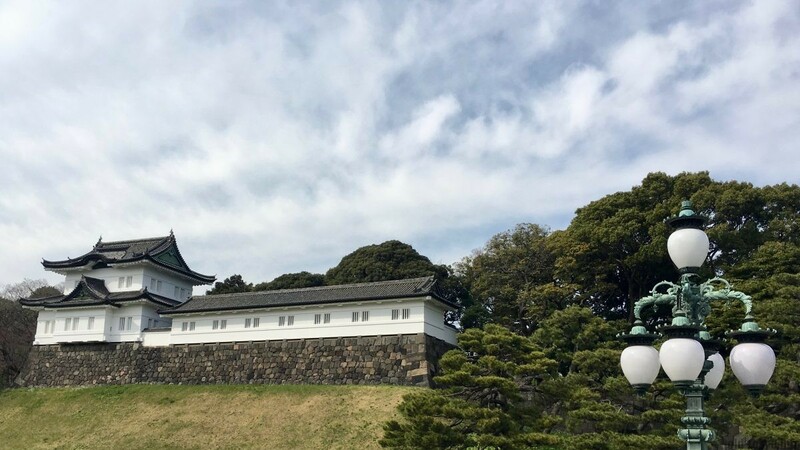 Dōshin-bansho Guardhouse: The castle needed to be watched 24/7. Dōshin-bansho Guardhouse was one of the places where samurai were stationed to keep constant watch. It was the first checkpoint on the route from Ote-mon to Edo Castle. You can find its location on the map at the bottom of this article with blue number 4. 5. Hyaku-nin-bansho Guardhouse: Literally the guardhouse for 100 people. This was the largest guardhouse with its 45 meters from north to south, it hosted actually 20 higher-ranked samurai (yoriki) together with 100 lower-ranked samurai (dōshin), day and night. You can find its location on the map at the bottom of this article with blue number 5. 6. Ō-bansho Guardhouse: This was the guardhouse where the higher-ranked samurai were garrisoned. It was located just after the main inside gate (of which you can only see remnants, the stone walls). You can find its location on the map at the bottom of this article with blue number 6. 7. Fujimi-tamon Defense House (mid-17th century): . A long narrow defense building from which you once could see Mt Fuji, and overlooks Hasuike-bori (Lotus-growing moat). Fujimi-tamon is the only original building from the Edo Castle that you can enter. You can find its location on the map at the bottom of this article with blue number 7. The East Gardens is the actual location of the former Edo Castle. Here you can find the remnants of the castle, which is actually nothing more than the stone foundations. In this area many of the previously mentioned buildings are located. The Ninomaru Garden is one part of the East Gardens. This garden is not an original, but made based on a diagram of a mid-18th century garden that used to be located at this very spot. Central to the garden is the pond, which is covered in summer with yellow and white flowers. There is also an iris garden, originating from the iris garden at Meiji Shrine. This garden is at its best late May until mid-June. Moreover, the garden hosts the Suwa-no-chaya Teahouse that was built in 1912. It was ordered by Emperor Meiji and used to be located in the Fukiage Garden. While the garden is a pleasant addition to an Imperial Palace visit, I am afraid there are much nicer gardens out there in Tokyo such as Rikugien and Korakuen. 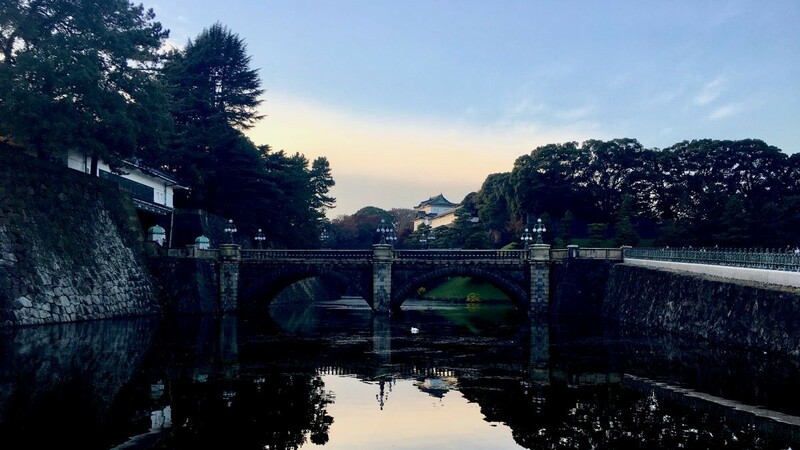 Around the Imperial Palace and the East Gardens are the outer gardens, a collection of gardens and parks, each with their own distinct characteristics, but not that special in order to base your visit around them. Chidori-ga-fuchi Moat: one of the 12 moats around the palace/castle, a famous spot in sakura season. Kitanaomaru Park: park to the north with the Nippon Budokan and several museums. Wadakura Fountain Park: park to the south with fountains created to celebrate the wedding of Akihito and Michiko (1961) with additions for the marriage celebration of Naruhito and Masako (1995). Kogyo-gaien National Park: large garden at the southern tip of the grounds with the statue of Kusunoki Masashige (1294-1336), a 14th-century samurai. 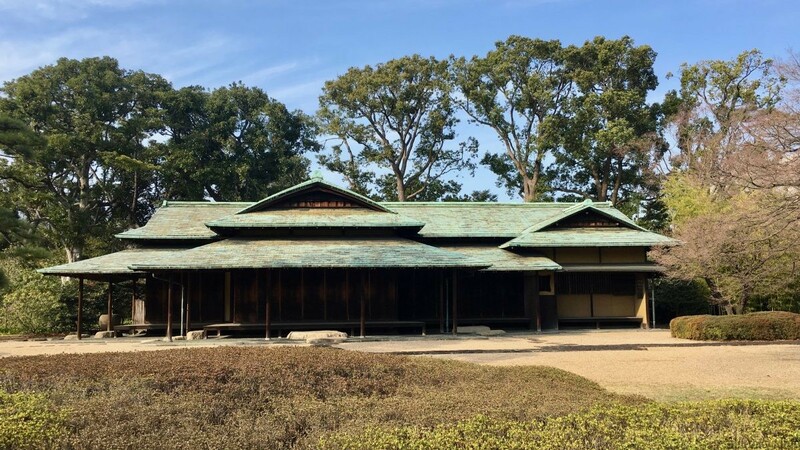 There are 2 interpretations of Kogyo-gaien (literally outer gardens), one is that it includes all of the green areas around the palace grounds including the East Gardens, the other is the garden at the very south only (as you will find on google maps). 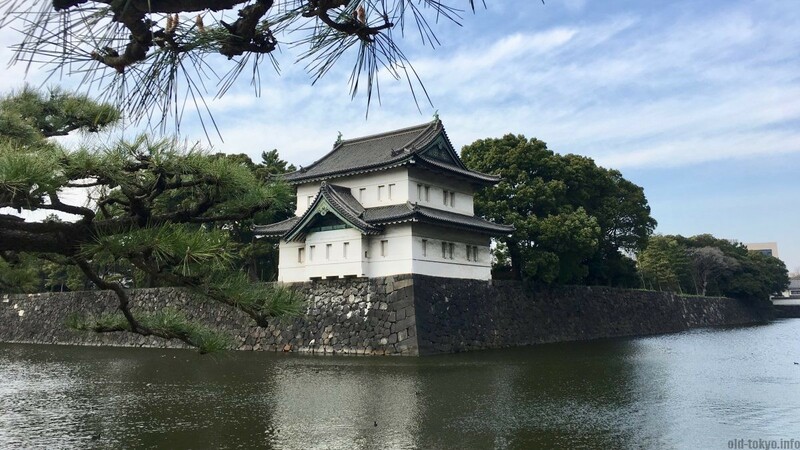 Visiting the Imperial Palace can easily take a whole day if you are not prepared. Without knowing where to go and what to do you might even leave with the impression that it is quite boring. My suggested itinerary is the purple line on my map, the yellow line is the route of the official free tour. First book the free guided tour in advance! I booked my tour a week before my visit and at that time there were few slots available. It might be that at your preferred dates the palace is closed due to a special occasion, so the earlier you book the better (tour not available on Sundays and Mondays). Go first to Meganebashi and Nijubashi (purple star on my map) where you have a nice view over the 2 bridges and the Fushimi-Yagura Watchtower in the background (this scenic viewpoint is not included in the free tour from the Imperial Agency). If you go early in the morning it won’t be that crowded and with the sun coming from the east (you will look west) it gives you the best light to take a photo. The closest stations to this area are Sakuradamon Station (Yurakucho line), Hibiya Station (Mita, Hibiya and Chiyoda line) or Nijubashi Station (Chiyoda line). Please note you will have to walk a bit to get there, so best to arrive latest by 9:30 to allow for some time before joining the tour. Arrive at the Kikyomon gate before 9:50 and show your tour reservation confirmation to the guard (photo ID sometimes required as well). The tour starts at 10:00 and will take until 11:15. It will take you into the grounds and mainly show you the west side where the current Imperial Palace is located. It will also give attention to Fujimi-Yagura Watchtower and Fushimi-Yagura Watchtower and take you over the iron bridge. After the tour has finished, walk to Ote-mon gate, the main entrance to former Edo Castle. On your way, you will walk past Sakurada-Niju-Yagura Watchtower. If you are on schedule, you will enter around 11:30. 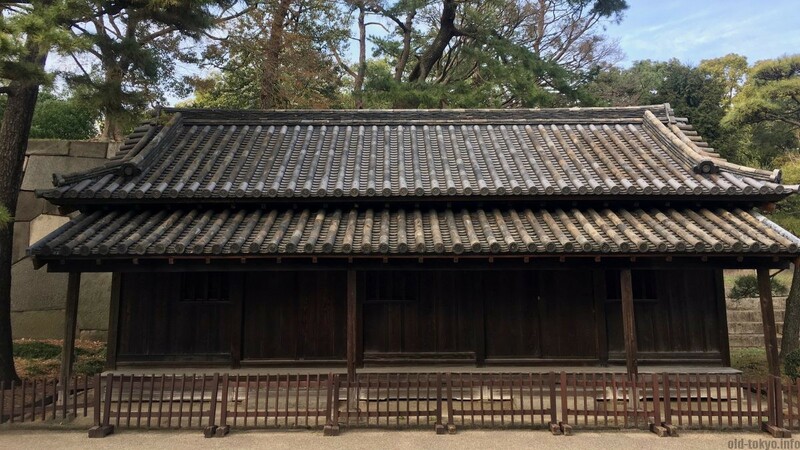 Next have a look at the three Edo period guardhouses, then continue to Fujimi-tamon Defense House, the only building on the site that you can enter. This will take until around 12:15, depending on how much time you spend at the the defense house. 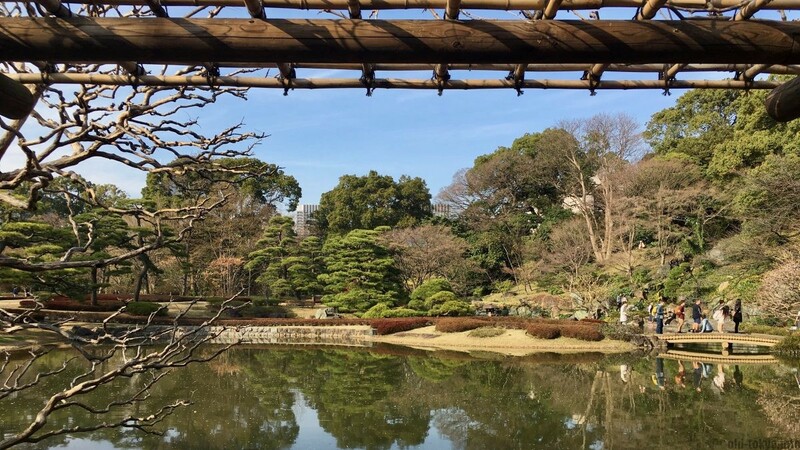 Then continue to the Edo Castle Ruins and finish by having a walk in the Ninomaru garden, 1 hour should give you ample time to explore these two locations. East Gardens: 9:00-16:30 (last entry 16:00). Closed on Monday and Friday. From April 15 to the end of August: 9:00-17:00 (last entry 16:30). Closed on holidays or at special occasions. The free tour is organised every day except Sunday and Monday. Not on holidays or at special occasions (quite a lot of days). Reservation required. Tours are at 10:00 or at 13:30, in summer only at 10:00. On the map above, my suggested itinerary is in purple, the itinerary of the official free tour is in yellow. I recommend to do both the purple and yellow route.